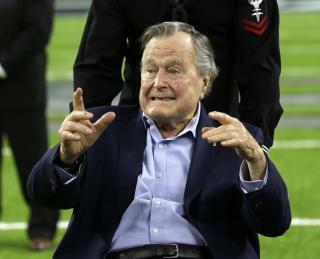 (Newser) – Former President George HW Bush has been hospitalized in Houston for four days with a recurrence of a case of pneumonia he had earlier in the year, a family spokesperson said Tuesday. The 92-year-old former president and father of a former president has been in Methodist Hospital in Houston since Friday for observation because of a persistent cough, Jim McGrath said in a brief statement. He said doctors diagnosed a mild case of pneumonia that has been treated and resolved. The former president "is in very good spirits and is being held for further observation while he regains his strength," the AP quotes McGrath as saying. I was certainly no fan of his while he was President, but I've always considered him a man of integrity who put country before politics. Many on today's Left and Right (especially the Right!) would do well to follow his example. I think he's on his last legs! Liberal Newser could have posted a Better Photo.. They can Bash Trump with Unappealing photos all they want... But there is No Need to attack a sick and dying American President..